I have been lusting over this watch for the last 5 or so years. To me, it is one of the most beautiful watches ever made. It is both simple yet sophisticated. If nothing else it is elegant. As with all that follows please forgive the cell phone pictures. It is a true disservice to such a beautiful watch. Watch from the back - The display back is just stunning. As many of you know the movement is all 18k gold. Not gaudy rather refined and pure class. 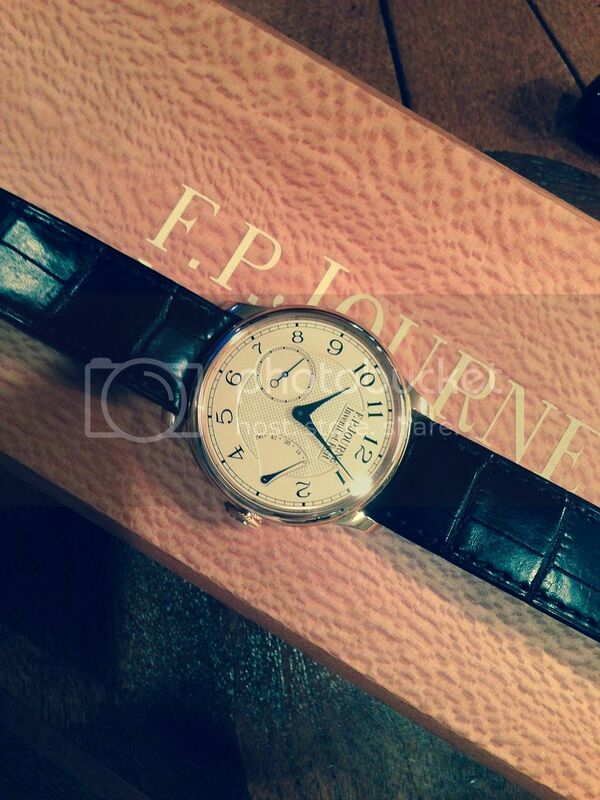 The FP Journe 38mm RG Chronometre Souverain. The watch has perfect dimensions. It is thin and the case diameter of 38mm is the perfect size for my 6.75" wrist. It embodies the soul of its designer. I first seen this watch and tried it on in NYC about 5 years ago. 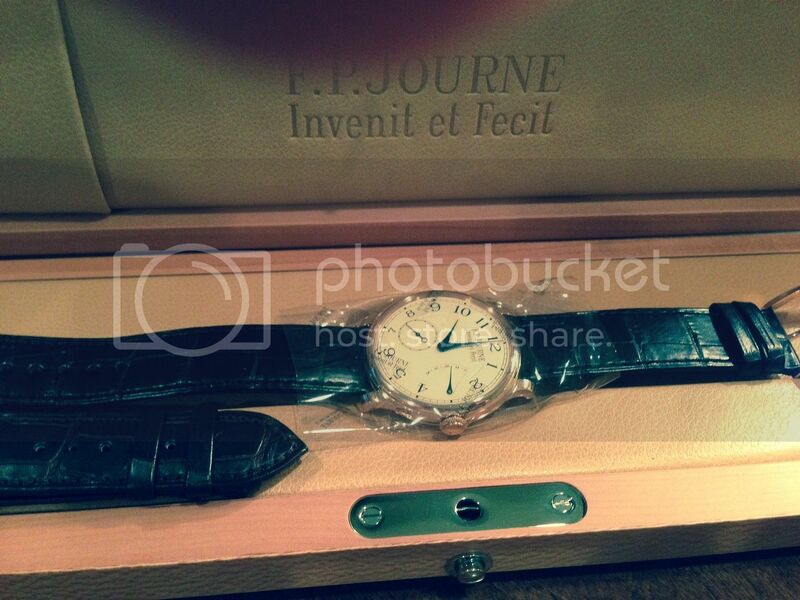 At the time I lusted after this and the Richard Lange. 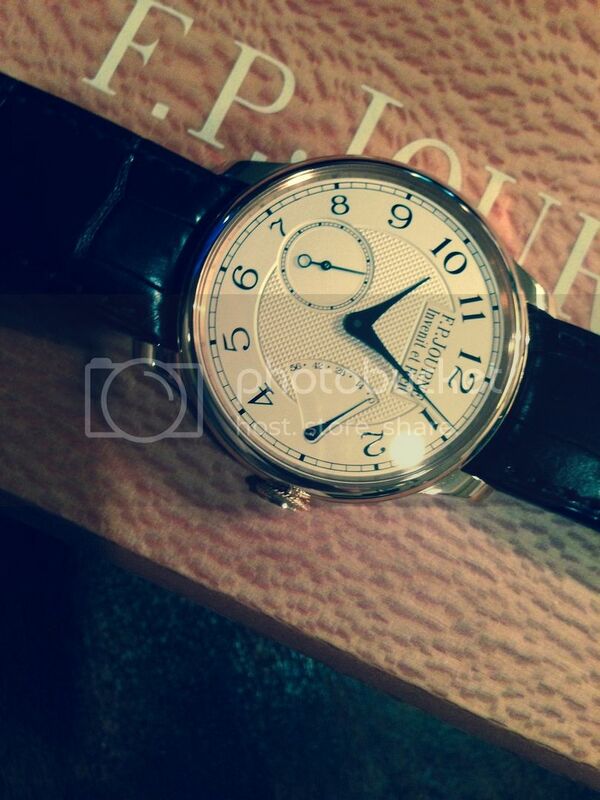 I have another Lange (1815) that I have been very happy with and was leaning toward the Richard Lange. However once I tried them on the Richard Lange shape and size wore way too large for me. The Journe feels perfect. It is a work of art. The finishing and details are amazing. There is nothing I would change on it. This beauty was hard to find. I have been watching the used market and none have popped up. 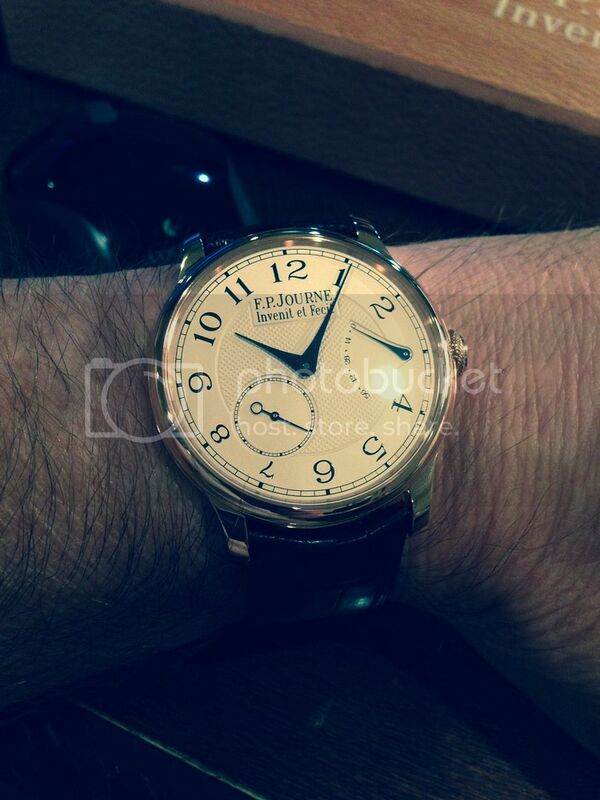 From what I understand Journe stopped making the 38mm. In addition I wanted the previous style face with the blued hands. However the NYC Boutique was able to help me out. Just so happens they had one in stock. 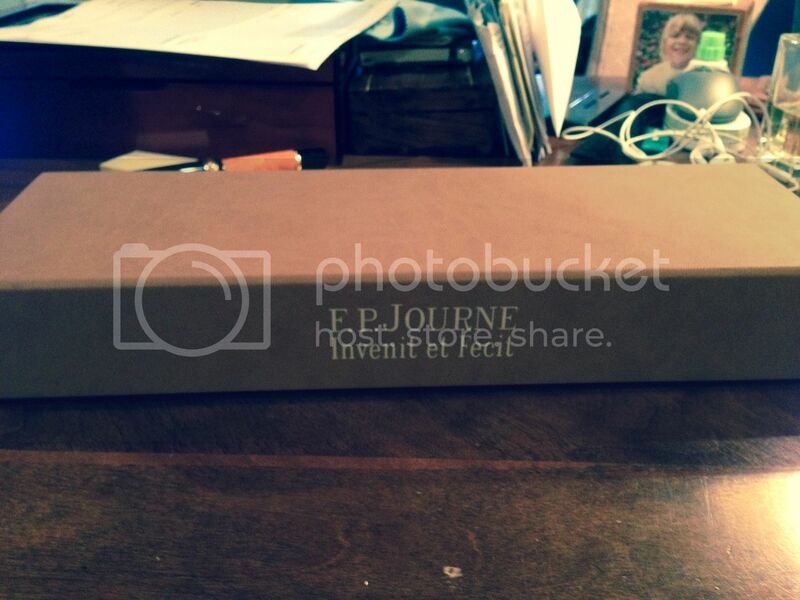 I worked with one of the boutique managers, Fabienne who was super. Great communication was provided including answering emails after hours taking the anxiety out of a remote purchase. In fact all of their staff was knowledgeable courteous, and professional. To sum it up the boutiques buying experience was extraordinary. 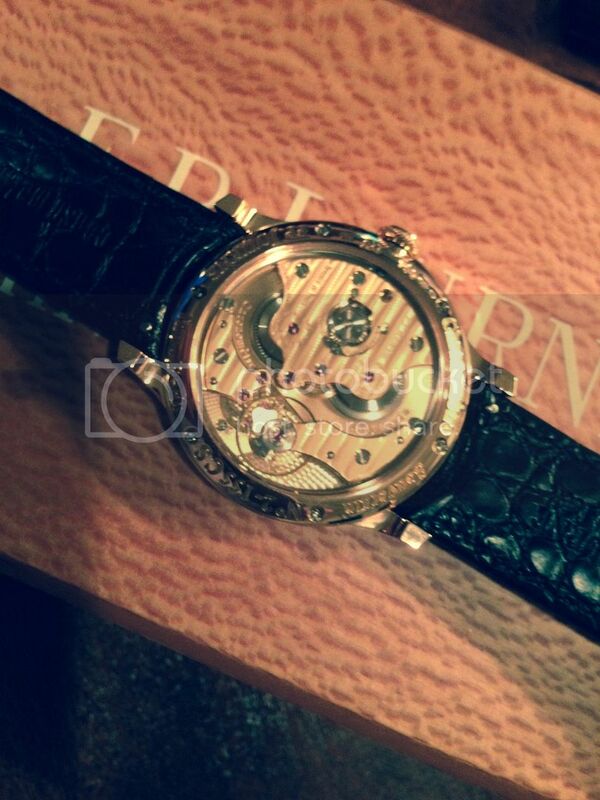 Now that my grail has been acquired there is no other timepiece I lust. Sure I will be changing up my collection maybe swapping out a few just to keep things interesting. Maybe even sell one or two as I have too many. But I expect this will remain. Thanks for reading guys and allowing me to share my happiness.